A chilling reminder of the dangerous world we live in, this riveting documentary reveals the innermost workings of some of the most warped minds in recent history. 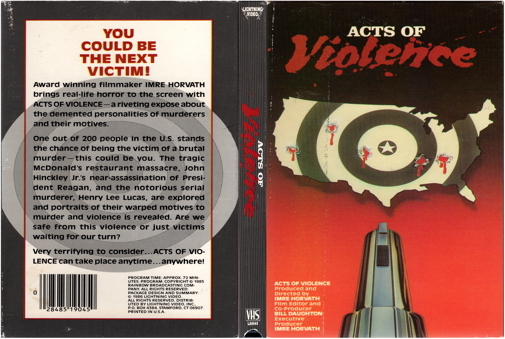 From the violent shooting spree in a San Ysidro MacDonald's restaurant to the assassination attempt on Ronald Reagan to the predations of serial murderer Henry Lee Lucas, see the pattern of violence as it extends in our culture and society. YOU COULD BE THE NEXT VICTIM! Award winning filmmaker Imre Horvath brings real-life horror to the screen with ACTS OF VIOLENCE -- a riveting expose about the demented personalities of murderers and their motives. One out of 200 people in the U.S. stands the chance of being the victim of a brutal murder-- this could be you. The tragic McDonald's massacre, John Hinckley Jr.'s near-assassination of President Reagan, and the notorious serial murderer, Henry Lee Lucas, are explored and portraits of their warped motives to murder and violence is revealed. Are we safe from this violence or just victims waiting for our turn? Very terrifying to consider... ACTS OF VIOLENCE can take place anytime...anywhere!